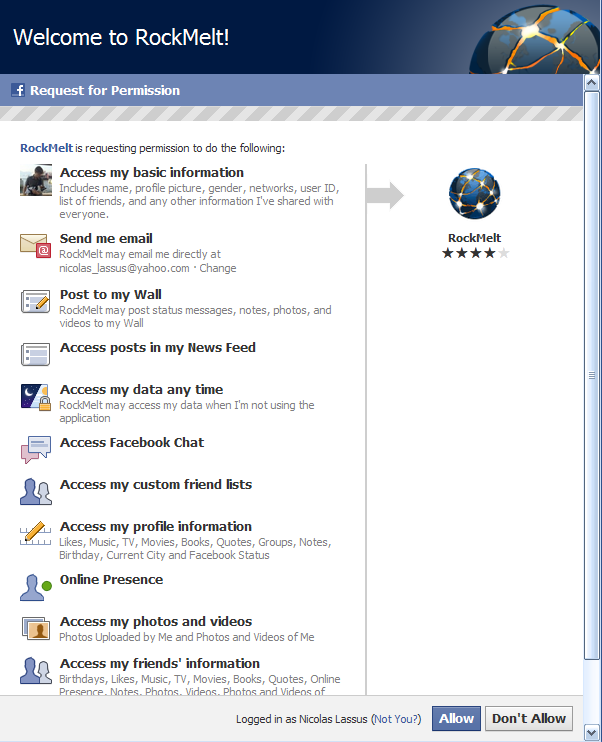 I was happy to try the new RockMelt browser. Building sharing features into the browser sounded like an interesting idea. 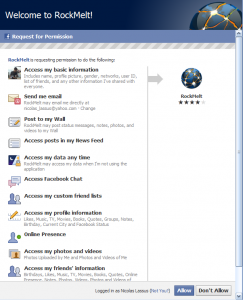 … and then I saw the Facebook Connect permission screen. As much as I wanted to try this. There is no way I would consciously face such a screen and click “allow” for something I never got to try first and that I had time building trust with. PS: Woh… I posted something on my blog! YEEHAA! Let’s see if I can keep doing it. During one of my Fora.tv lunch breaks, I came across this talk that discusses how the creators of the “Heroes” series managed to develop such a strong community around the show, and most importantly how this community spans over a large number of touchpoints. There are many lessons that brands can learn from such a case study. I will try to summarize a few here that I find key. Remember that one liner summarizing your vision that some consultant or trainer asked you to come up with. Well, that’s really useful to have. Heroes was created around the message: “Save the world”. This message was not only used in the series, but also in communications and activities organized around the series, with ultimately a game developed to get people to do good. Whether it is internally with your employees or externally with your customers, this message will help unite everyone and give a personality to the experience people have with your company. 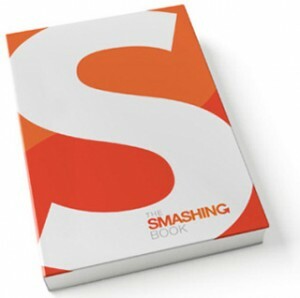 You live in Hong Kong and you are into Web Design, you may be interested in buying Smashing Book. The book is a compilation of articles from Smashing Magazine that covers graphic design, programming, but also user experience and web strategy. It looks like a very nice reference book to have by your side. We are organizing to bulk buy a number of copies in order to enjoy some discount on the price. The more people we can gather, the better the price can be. So, if you are interested, please drop me a message below and I will add you to our list of people interested. If we can reach at least 20 people, we will order the book. 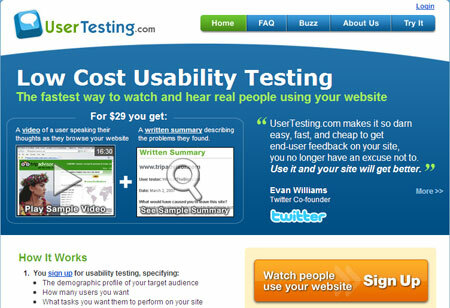 I’ve heard about UserTesting.com a few month back during an IxDA meeting and was intrigued. Then I ended up reading about it on UX Booth in a review they made of the service. At that time I was really getting interested in the service and decided to try it out as soon as the opportunity would present itself. I finally got this opportunity back in December. Below is my a short summary of my experience with it. Do people like clutter and content overload? Notice how much space the navigation area takes and how many links it includes. 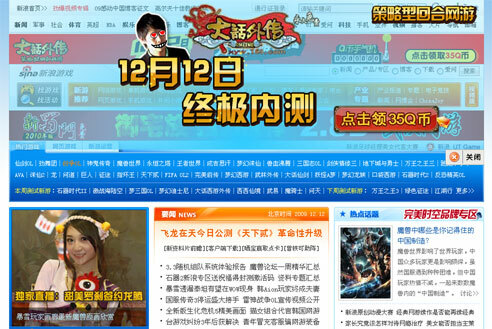 Also note this is the gaming area of the site, but the main content inthe middle at the very top is a news digest. See it live at http://games.sina.com.cn. A quick post with two videos, one not so serious (Thanks to Steve Portigal for Twitting that one – very funny) and one more inline with what things may soon be for us readers. These videos can make us wonder whether reading, watching, listening will soon be all merged into one seamless experience around content consumption. Great sources of inspiration. In a world of ever greater device integration, ebook readers seem to be anachronisms. iPhones enable phone calls, taking pictures, web browsing, gaming, reading and much more… all in one device! What do ebook Readers do? Well, they allow their users to … read books. So, what is so special about ebook readers that makes them an item of choice for many? And how can the ebook experience be pushed further to lure more people into purchasing them? These are the two questions I’ll focus on in this first post. In a second post, I will focus more specifically on the Kindle interface design with its goods and bads.